Because this is a print on demand book, Waldin sent me pdfs to review. Which means it’s impossible to get a feel for the heft and smell and visual impact of his book. But ultimately no big deal – it’s the content that’s important. 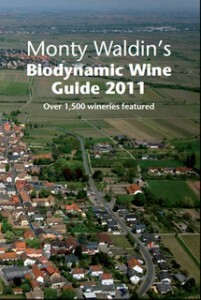 Waldin’s first book on biodynamic wines was written in 2004, and he later made his own wines using biodynamic techniques in the south of France. So he is evidently a passionate advocate of biodynamic viticulture. His book follows a logical process – outlining the origin of biodynamics, before detailing the preparations / treatments / infusions and what they do. It is a little weird, though, having a chapter on how the book works as Chapter 10, which might have been better placed at the front. Waldin’s definition of organic viticulture is a little disparaging, especially given the number of certified organic producers he cites in part 2, and I feel he rather glosses over the issue of copper build-up in the soil which is an issue for both organic and biodynamic viticulture. He does, though, devote a paragraph to this rather serious issue later in the book (p 130). His ‘origins of biodynamics’ takes the reader thoughtfully through the ‘scientific substance versus spiritual signs’ arguments before embarking on discussing the preparations, with interesting history, anecdote and example, as well as the details of what each comprises and does; how to make and when to use. The importance of certification is addressed, as he says “As biodynamics has become such a buzz-word in wine there is a predictable trend of dyed-in-the-wool conventional wineries miraculously becoming “biodynamic” overnight.” This does mean when it comes to the wine, the onus is on the buyer to check the actual status of any producer. Part 2, which comprises nearly three quarters of the book, gives the details of organic and biodynamic growers across the world, by country. I found this a little confusing as organic cultivation is incontrovertibly different from biodynamic cultivation. So reader beware: organic is most definitely not biodynamic. Each country gets an introduction detailing some of their important organisations (each region in France), as well as the relative importance of combined organic/biodynamic viticulture. So about 1% of Australia’s vineyard hectarage is certified organic and biodynamic, about 3.5% of Austria’s vineyards etc., and the appendix usefully lists all these in a chart. The likelihood is, though, that most of those hectares are organic rather than biodynamic. Waldin’s first sentence for each producer is their certification status which is unambiguous and helpful, though one or two producers appear to have been ‘in conversion’ for much longer than it takes to convert. As a minimum each producer has contact details listed. Most producers get a little or larger biography, and there are plenty of enjoyable stories among them. A few icons, including Alvaro Espinoza of Chile, Jean-Michel Deiss of Alsace and James Millton of New Zealand also get a picture. Waldin rightly makes no comment on the quality of the wines being produced. A method of viticulture, certified or otherwise, gives no guarantee of better quality than any other method of viticulture.